The furgon from Valbone to Bajram Curri leaves every morning at 7:00. There’s only one furgonper day and I don’t know why it leaves at such a ridiculous hour. It’s not a long drive, only maybe two hours. It’s probably the case that there is literally only one furgon that makes the drive and it has to be in Bajram Curri by a certain time to drive back as well. Valbone is a one hour hike from Rogam, so I had an early morning; Dennis and Ardit helped me wake up at about 5:45. I’d had a feverish night, hadn’t slept well and was still a bit shaky from my trials of the night before, so I wasn’t moving too fast. I threw my few belongings into my bag, filled my little water bottle, paid Dennis for the evening and headed down the road. I was sad to not have another day in Rogam and sad that I hadn’t had a chance to say goodbye to Aurela, considering the ridiculous hour I had to leave, but knew that had I stayed for another day my insides would not have recovered. I needed a day to myself to rest. Rogam sits on the base of the mountain pass I had climbed over the previous day from Thethi. I had stayed at the first collection of houses I had come to and there were about three other compounds scattered about as I continued down the hill. At the bottom of the hill there is a path on some rocks, but the entire way to Valbone looks like it must be a raging river during winter. My guess is that the winters are quite harsh and that Rogam is basically uninhabitable. Valbone is at least accessible by a road, but Rogam is a one hour hike up a riverbede, which is why the Valbone families that live there stay the year, whereas the Rogam families all go to different cities during the winter. The hike down the hill was very peaceful, despite my lack of sleep and shaken insides. The furgondrove through Valbone and I saw many guesthouses as we passed through. This is evidence that Valbone, like Thethi, is getting some tourist attention. There were also many crumbling concrete structures scattered about, showing that prior attempts at investment in the area have fallen short. Despite the bunkers and crumbling buildings, it was a beautiful drive through the Valbone National Park. The sun was rising over the mountains, the Valbone river was a very clear blue and the furgonnavigated the treacherous mountain roads without incident. I was heading out of the mountains and my time in Albania was coming to a close. I would have a day in Bajram Curri, then ride the ferry on Lake Koman, and eventually make my way to Pogradec, on Lake Ohrid, before making my way back to Istanbul. I felt that my short time in the villages had put my Albania trip on a completely different track. Just a few days before, in Tirana, I had been debating just abandoning the Albania travel plan and going somewhere nicer for my holiday. After my time in the mountains I was thinking about ways to come back and teach summer programs. I felt a mixture of wonder from this remote experience in the mountains, very humbled by what I had seen, saddened upon seeing the living conditions of those there, and very ashamed of my prior intentions upon visiting the country. Even though the furgon was fully packed and uncomfortable, with seventeen people on board, I was able to sleep a bit. I awoke in the dusty, slightly disappointing town of Bajram Curri, just outside the Valbone National Park. I paid the driver, hoisted my bag and set out in the dust in search of a hotel. The first place I saw was on the main road of Bajram Curri, near where the furgons arrive and depart. There’s an accompanying restaurant, so it appeared that this was the town’s big business. It was a bit out of my price range, so I headed down the hill where I had seen a sign for another hotel above a bar which had looked a bit dodgy. This was more my style and price range so I agreed with the barman to spend the night. It was very nice to have a hot shower after a few days up in the mountains in the villages where the homes didn’t have showers and the only water was from a hose outside. My hotel had a television with a few channels and it had air conditioning so I had a shower, turned on the AC and curled up in bed hoping a nap would restore my insides. As disappointed as I was to not be spending another day in Rogam, and there was nothing in Bajram Curri and it’s ugly, worn down and dangerous, it was good for me to be on my own in a hotel room, getting my flu symptoms under control. It seemed strange to me, though, that I was just a few hours from the villages where I’d spent the last few days, and I was had plenty of electricity, air conditioning, a functional television and plenty of hot water. Bajram Curri is the largest city in the Tropoje region in Albania, which is in the Northeastern corner of the country, bordering Montenegro and Kosovo. It is basically a small town. It has a few markets, a few cafes, a school, a restaurant or two and there are two hotels. People in the villages in the area such as Rogam, Valbone, or some others that tourists don’t go, can go to Bajram Curri if they need to buy things from stores such as flour, soap, household cleaners or things like that. It might be the case that the furgonleaves so early from Valbone because people need to go to work in Bajram Curri. I don’t think that this is very plausible, however, as I don’t think there is very much legitimate work in Bajram Curri. The Tropoje region is the one that’s on travel advisory lists for travelers from Canada, the U.K. And Australia because it is so remote that the government basically does not operate up there and the entire region is under mafia control. I wouldn’t recommend spending a lot of time in Bajram Curri on a trip through Northern Albania. There are only a few dusty roads to walk down, as I did after napping for a while. I walked up the hill to the restaurant attached to the hotel I’d stopped at before. I waited about ten minutes before receiving a menu and then about another fifteen minutes until I received my dinner. I wasn’t sure how much I should risk eating, so just ordered a salad. As I navigated my way down a few streets to the other hotel I admired the dust and the black Mercedes cars with black tinted windows, cruising or idling along dusty, pothole filled alleys. I saw a man in a streetside cafe sitting with a pile of money stacked about three inches high on the table. Back at the hotel I decided I’d sit downstairs and have a beer before heading up to bed. When I was nearly done with my beer I asked the guy mopping the floors when I could get the furgon to Fierze, where I could catch the passenger ferry for the stunning ride along lake Koman. He said that if I want to ride the ferry I would need to get on the 6am furgonin order to make it. There’s only one ferry per day and the only furgon that makes it there in time leaves at 6am. As I was talking to this man about furgons, ferry times and how to pay for my room, a very drunk man stumbled into the bar who immediately drew my attention. First of all, he was carrying an AK-47 on his shoulder. I’d read a bit about the number of Kalashnikov rifles in homes in Albania, and with my experience with the drunk guys up in the hills near Rogam, I wasn’t too shocked by this sight. It just struck me as a bit odd that this man should be walking around and stop in the bar under the hotel with his AK-47. It was also an odd sight because he was dressed in a manner that didn’t seem quite normal. He was wearing a blue uniform that looked like it was made of something like velvet. But it looked like something soldiers would have worn in the French revolution. Basically, this man looked like a very drunk, dusty, Albanian Napoleon who had substituted his had for an AK-47. I decided I didn’t want to hang around the bar much longer to see what his business was, so I paid for my beer and went up to bed. I set my alarm for 5:30 so I could be sure to make it to the furgon on time. I had no trouble waking up as when I was emerging from my slumber there was an argument outside my door between an Albanian and a guest of the hotel, someone whose English was not great so was trying to speak some French as well. It had something to do with payment of money of some sort. I let the argument die down before I left the hotel, leaving my key in the door and money for the night on my pillow, as there was nobody in the reception at 5:45 in the morning. I wandered around outside for a bit, looking for where the furgon to Fierze would be. I walked around the area by where I had been dropped off the day before, as the guy in the bar had told me the night before that was where it would leave at six. There was nothing in sight, so I asked a guy standing in his shop if he knew where the furgon departed for Fierze. He didn’t speak any English so I used my journal again to draw a picture of a boat on water to let him know that I wanted to get on the Koman ferry. He led me to understand that the furgondidn’t leave at 6am, the ferry left Koman at 6. I assured him that I spoke to the man in the bar who had told me to get on the furgonat 6. He led me to the corner that the furgon would drive past where we found a German backpacker who was also going to Fierze and a young woman from Tirana. She had been coming from Kosovo the night before and had had car trouble, leaving her quite upset at being stranded in Bajram Curri of all places. Apparently all of us had spent the night in the same hotel. The German guy and I told the Albanian girl that we needed to get to Fierze for the Koman ferry, which she told to the shopkeeper, who then told us again that no, the ferry left at 6am and we wouldn’t make it. Meanwhile, it was five to six and there had been no furgons but had been plenty of cars drive past, with ten mangy street dogs in tow, chasing after each one. While we were deciding what to do the German guy told me about his miserable morning. The night before, he had also talked to a guy in the hotel/bar to double check the ferry time. He had been told that he needed to get the 5:45 furgon, but of course there hadn’t been one. He had woken up early and had left the hotel, having paid the night before down at the bar. When he left the hotel, however, a man with an AK-47 rifle had argued with him outside. The man had seemed a bit mentally unstable and quite drunk and had been trying to get the German to pay for the hotel room. The German had tried to argue in such a manner so as to not upset the man with the AK-47 and tried to assure him that he had paid at the bar the night before. Somehow he managed to flee the presence of the strange man and made his way to the corner where the furgonwould depart but there hadn’t been one yet. At this point I inquired as to the dress of the drunk, strange, AK-47 wielding man. Had he been wearing a blue uniform that looked like it was something Napoleon might have worn? Indeed he had been. I realized that the argument that I’d heard outside my door in the morning had probably been with the AK-47 man as well, trying to make sure everyone was paying for their rooms. We were laughing about this and told the Albanian girl about it too, and I described the man’s clothes. Oh, him, she said. You don’t need to worry about him, he guards the streets at night. He’s done this for twenty years. Eventually we realized that there wasn’t going to be a furgon to Fierze to catch the ferry. The German and I decided that we should just share a taxi in the hopes that nobody really knew when the ferry left. Maybe we could catch it in time. The Albanian girl explained this to the shopkeeper, who called a taxi over for us. The taxi brought us down a few dusty, pothole filled dirt roads which let to the ferry dock. There were two broken down car ferries and a little shack where there were a few workers smoking and drinking rakia. We arrived at about 6:20, and the boat had left about five minutes earlier. We weren’t quite sure what we would do. Neither of us wanted to spend another night in Bajram Curri. The men in the shops told us not to worry, though, and they called the boat driver. They told us the boat would be here in two minutes. We couldn’t believe our luck. Anywhere else in the world if you miss your boat, you miss your boat. 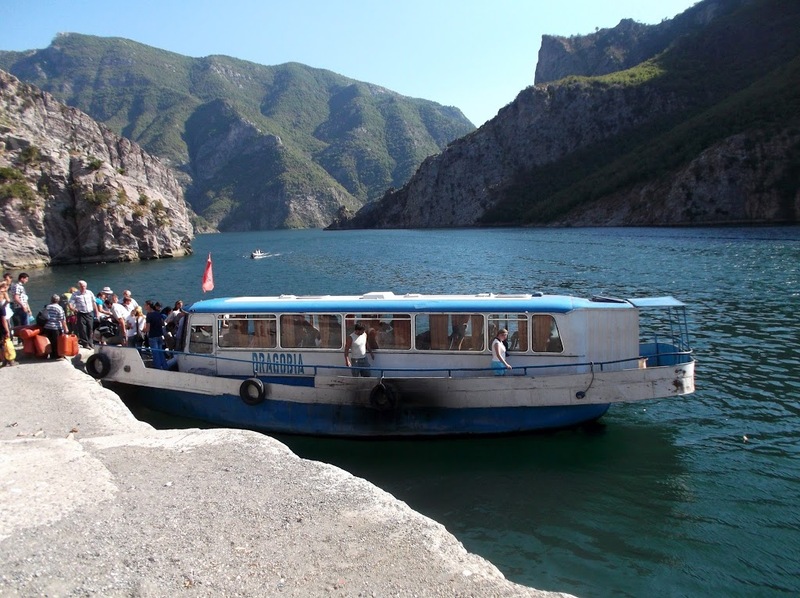 In Albania, if there are extra passengers who will be paying for the ferry, it will turn around for you and pick you up. After a few minutes we saw a little putt-putt motored boat making its way for us. It pulled up to shore, we hopped on, and were off down lake Koman.